Abhishekam or Abhisegam, is a ritual in which a deity is bathed in prescribed ingredients with the chanting of prescribed mantras. It is a sacred ritual and is believed that people who perform it and people who witness it, benefit spiritually. It is an age old practice and is one of the most widely practised temple rituals. While there are many varieties of Abhishekams, the two fundamental categories are: Abhishekam's for the male deity and Abhishekam for the female deity-- the Purush Sooktam and the Shree Sooktam. Every Friday, at Tirumala Tirupati Devastanam, after Suprabhatha Seva, the regular Thomala and Archana Sevas are done in privacy and then the Abhishekam called the Srivari Abhishekam is performed; this is the most ancient of all Arjitha Sevas, that are today performed at the hill shrine of Lord Venkateswara. The Abhishekam starts with the first wash with Sacred water, brought from Akasa Ganga Theertham, and followed by--- Milk, Suddhodakam, Chandanam, scented articles like powdered Pachcha Karpooram, Saffron paste, drops of civet oil etc., which are brought in silver vessels. 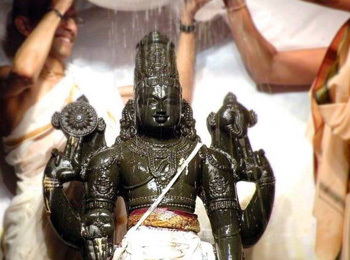 While performing the Abhishekam to the Moola Virat, Purshasukta, Narayanasukta, Srisukta, Bhusuktha, Neelasuktha and selected Pasurams from the Divya Pradbandham are all recited by the priests.